On Tuesday of this week I attended the 1st Ministerial Forum for Broadband Development in Latin America and the Caribbean at the Shilla Hotel in Seoul and delivered one of two keynote presentations. The forum was sponsored by the Ministry of Science, ICT and Future Planning along with the Inter American Development Bank and was attended by ICT ministers and delegations from eleven Latin American countries. The discussions during the day were wide-ranging and most interesting. They forced me to think about many things, including the topic of this post. I decided to finally create the graphic included here to illustrate the far reaching consequences of decisions and long-range planning. In 1981, led by technocrats in the Blue House, experts from academia, industry and government drafter a "Long term plan to invigorate the electronics sector." The slides I prepared for my presentation to the Ministers used the growth curve in South Korea's GNI per capita, based on World Bank data, as an illustration to show the tremendous economic and social development from 1980 to the present. 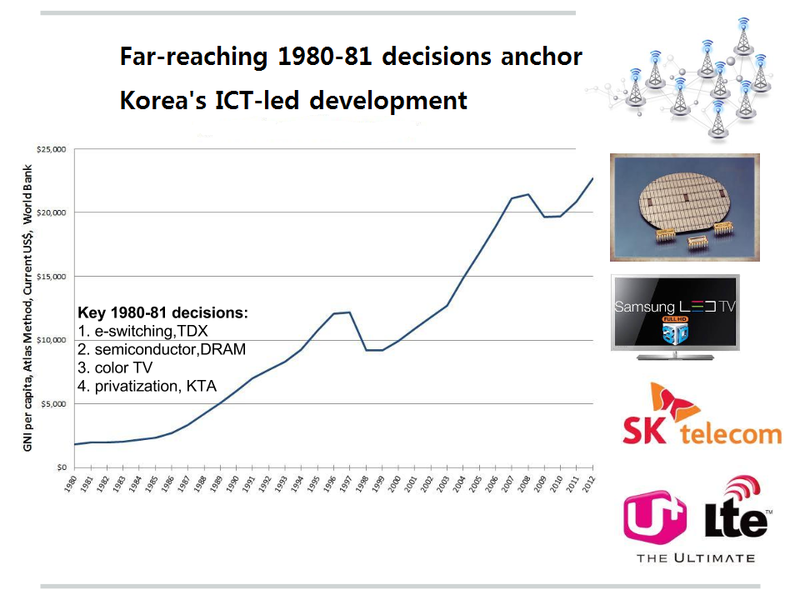 One of the points I made, but probably did not adequately explain, is how decisions made in 1980 and 1981 addressed the ICT sector, years before that acronym (ICT =Information and Communications Technology) came into widespread use. As shown in the accompanying graphic (click to see a full size version) there were four key decisions. To develop and manufacture electronic switching systems through the TDX project. To enter the global semiconductor market, through the 4MB DRAM project. To begin color television broadcasting, which did not yet exist in Korea. To separate the telecommunications business from the Ministry of Communications by forming the Korea Telecommunications Authority (KTA), marking the start of privatization and deregulation. 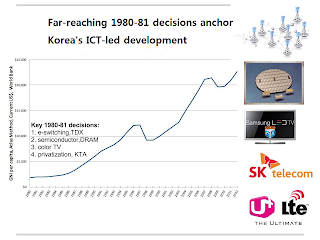 In retrospect, each of these decisions anchored an important part of South Korea's export-led economic and social development. The nation is now a major manufacturer and exporter of 1) advanced networks, 2) semiconductor chips, 3)color television sets and displays, and 4) mobile handsets and tablets.